The Foot and Ankle Service provides information, diagnosis, and both surgical and non-surgical treatment for individuals with a variety of foot and ankle problems, including athletic injuries, fractures, arthritis, and deformities. The Foot and Ankle Service is a component of UW Medical Center's Bone and Joint Surgery Center, which is ranked by U.S. News and World Report as the top orthopedic program in the western half of the United States. Our physicians, with support from research programs, lead the way in innovative care for foot and ankle problems. We are constantly developing new, more effective methods of evaluating and treating our patients. Our goal is for the patient to be able to return to full function and activities. Our team of orthopedic surgeons, rheumatologists, radiologists, podiatrists, therapists, and nurses specializing in foot and ankle problems use a multidisciplinary approach in caring for patients. There is easy access to other world-class experts at UWMC who can assist with diagnosis and treatment plans. Management options can range from simple exercises to major reconstructive surgery performed at UW Medical Center. 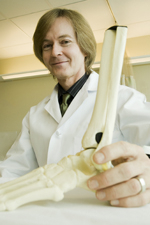 The University of Washington offers three clinics that provide information, diagnosis, and both surgical and non-surgical treatment for individuals with a wide variety of foot and ankle problems. You may make your own appointment at the Foot and Ankle Service or you may be referred by your physician. To make an appointment, please call: 206-520-5000 or Toll Free 877-520-5000. Sigvard T. Hansen, Jr. M.D.